The honeybee pollinates most trees and plants, such as apples, blueberries, cranberries, peaches, and peppers. In addition, bees provide us with honey and wax. Unlike most insects, honeybees can survive the winter as a colony. The size of the colony may range from as few as 15,000 bees in early March, to as many as 90,000 members in early May. As social insects, bees live together in an organized society. A colony consumes between 170-300 pounds of honey and 75-125 pounds of pollen per year. The three kinds of bees in a colony are the queen, workers, and drones. 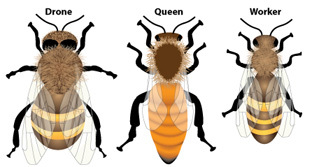 The queen is larger than other bees and has only one job: to lay eggs. Workers feed, groom, and protect the queen. During the height of the egg-laying season, she may lay as many as 2,000 eggs per day. To sustain the bee population, the queen lays the eggs in the cells where three days later they hatch into a tiny, white wormlike larvae which the workers feed royal jelly. If the workers want to raise a queen bee, they keep feeding that larva nutritious royal jelly, otherwise they switch the food to bee bread for the next two days. After the fifth day of feeding, the workers cover the cells with wax. Inside the cell the larvae develop into pupae, which look more like the adult bees. The pupae are enclosed for 13 days in the cell to transform into mature, winged bees. The mature bees chew out of the cell. A queen who is doing a good job may be allowed to live for several years but if she does not lay enough eggs to keep the colony happy, the workers may decide to raise new queens. The first new queen born will kill the old queen and the othernew hatching queens. Worker bees, infertile females, keep the colony running and make up almost the entire colony. In the winter only the queen and worker bees remain in the hive; the drones are pushed out and kept out by worker bees who act as guard bees. The bees you see flying about are most likely workers. They gather nectar and pollen from flowers. Then they fly back to the hive and deposit it in empty cells of honeycomb. Other worker bees then fan their wings over the nectar-filled cells to evaporate the water from it. The nectar, which originally contained from 8 to 55% sugar, becomes honey when it is 80% sugar and 20% water. Pollen gets trapped in the hairs on the bees' bodies when they enter flowers. 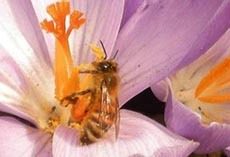 The workers then transfer this pollen to the pollen baskets on their rear legs. When they return to the hive they remove the pollen from the basket, and it is stored in honeycomb to be used at a later date as food for the developing larvae. Worker bees may fly as far as two miles from the hive to obtain food for the colony. The workers clean out the hive and build the honeycomb, which they make from wax, produced from glands on the underside of their abdomens. They also gather and prepare the food, control the temperature of the hive, and protect the colony from predators. The worker bees begin their first task from the second they hatch and continue until they die when their wings wear out. Drones, the males of the hive, come from unfertilized eggs. The colony usually contains only about one hundred of them during the warmer months of the year. They are larger and broader than worker bees, and they do not have a stinger. They mate with the queen from a nearby hive when she is on her mating flight. Never stand near the entrance to a hive because it is the job of the guard bees to sting any intruder. Field bees rarely sting because when they are far away from the hive, there isn't a colony to protect. A bee's stinger is barbed, and when it comes out, it has the bee's venom sac attached to it. If the stinger stays in the victim, or if the venom sac is squeezed in an attempt to remove it, all of the bee's venom will enter the victim. If you are stung, immediately scrape the stinger and sac from the skin with a fingernail or credit card.